I was just about to email you this story and was pretty surprised to hear that not only was demolition an option, but that the County Commissioners appear to accept it as fait accompli. If they're intent on demolition, the best scenario would be to sell the lander to a developer. I am sure plenty of people would champ at the bit to get a largish parcel inside the Loop. OR use the land to dismantle the loop, change the rail bridge, and access point from Great Jones, and make Roxboro two way. THAT would be my dream before a park or a new condo building. This seems incredibly wasteful and short sighted to me. This is a huge steel and concrete structure that should be put on the market, renovated, and filled with people, not demolished and replaced with an unneeded and steeply sloping "performance space" adjacent to two busy streets. Obviously a renovation would be expensive, but not when compared with the true costs of "recycling" a six-story building in favor of a vacant lot. Where does Commissioner Reckhow think those eyes on the street come from? They come from buildings, especially ones that have ground floor storefronts with restaurants and retail spaces in them, and a mix of offices and residential units above that generate foot traffic after 5:00. I've been hearing the county talk about tearing this building down for 4+ years now. Like a lot of county land use ideas, it seems to have been birthed out of thin air inside the county engineer's office. I've heard the county manager and engineer talk repeatedly of this idea that they want to 'reexpose' the 1916 county courthouse. Which seems a bit odd, given the general take-it-or-leave-it attitude the county has towards historic preservation. Given the certitude and persistence of this decision, I have to suspect (although I have no evidence) that there is some other reason for tearing the building down that hasn't come to light. Why don't they relocate the people who work in the third court house (across the street) into this building? Then tear down that courthouse (which, needlessly, takes up a whole city block) and offer the land and the block behind it (bounded by Parrish St, Church St., and Roxboro), which is currently a surface parking lot, to the developer or developers who will come up with the most creative urban development? Please e-mail your county commissioners and others about this issue. I have been corresponding with at least one of them and getting them to ask some more questions. I would like to know why the building is not a good candidate for renovation, and I'd also like to know what the ongoing plan is for the city of Durham. I think that Durham has the possibility to be the jewel of North Carolina if we develop with imagination and care. I know that Freelon Group is an architectural firm and a native one at that, but what is their role here? And who is the City Planner who is studying this matter? And how is a Gran Plan coming into being for Durham and what are its guiding principles? Best to all....etc. 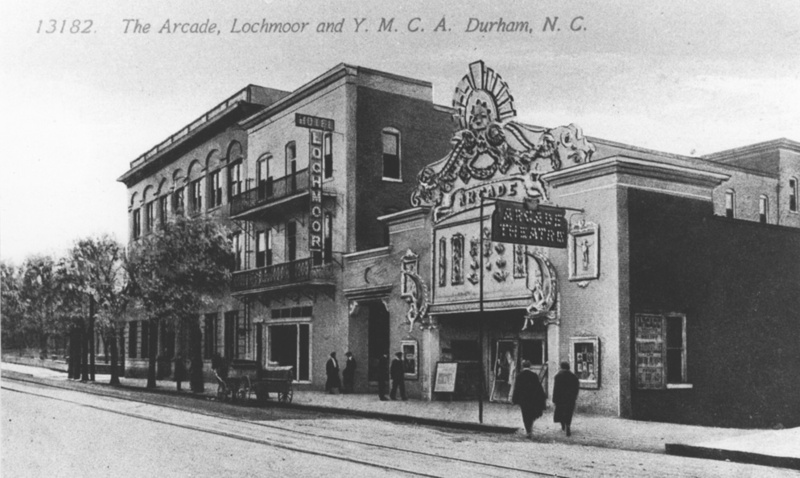 The Durham County Social Services building was constructed in 1966 on the former site of the Arcade Theater, Hotel Lochmoor, and the Durham YMCA, which had been demolished in 1961. 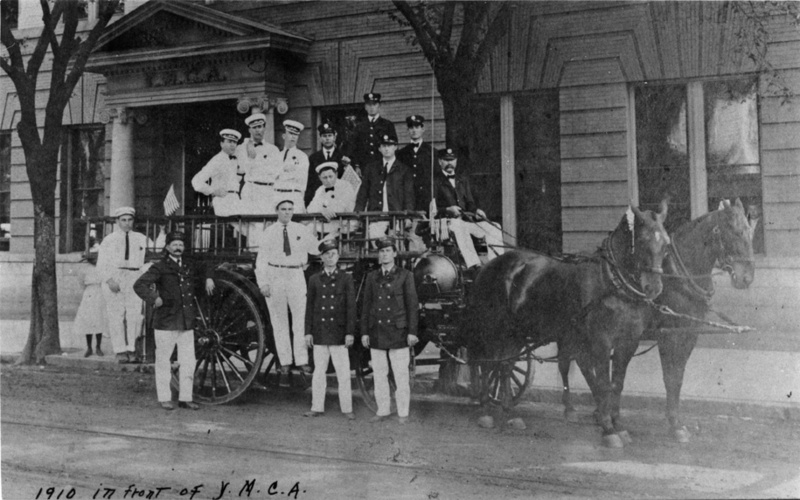 By the late 1950s, the YMCA had tired of their downtown location and tore down the old Pearl Mill Lyceum (school) on the north side of Trinty Avenue near Duke St. to build a new campus. 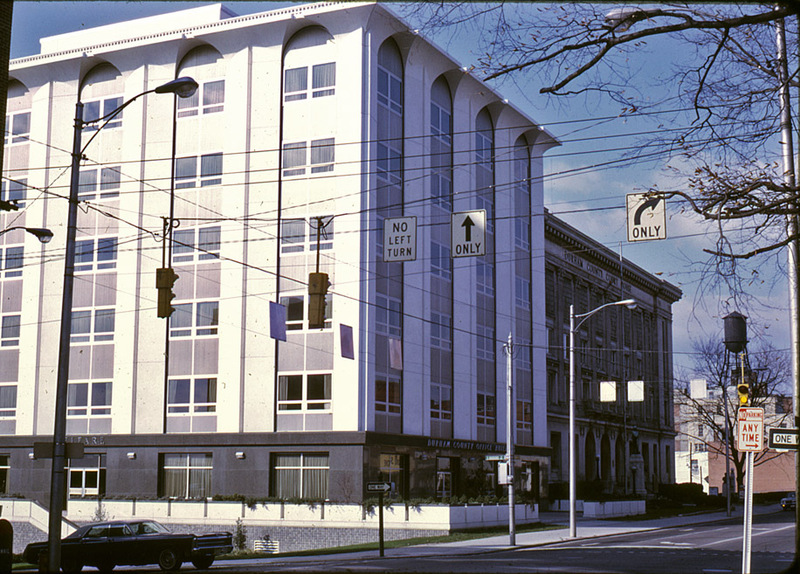 In 1966, the county built the new courthouse annex building on the location of the YMCA and Hotel Lochmoor. As of 2013, the county seems to be determined to tear this structure down with the relocation of the social services offices to the new "human services" building two blocks east. 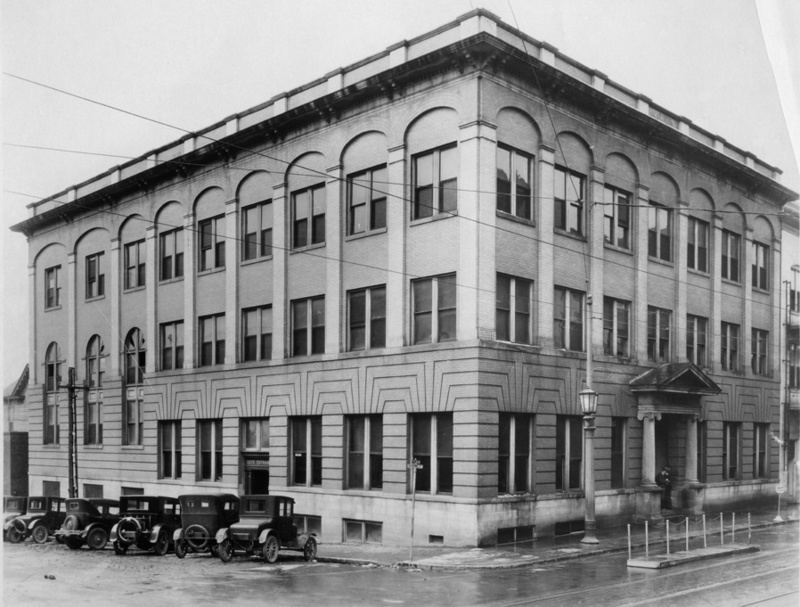 The building that until this month housed much of Durham’s Department of Social Services could be a memory in about two year’s time, replaced by a new public square next to the county offices. County Engineer Glen Whisler and two architects briefed County Commissioners on the possibilities that demolition of the old DSS headquarters at 220 E. Main Street would create. Replacing the late-1960s structure with public open space could “act as a bit of a catalyst” for other projects on downtown’s east end, landscape architect Dan Jewell said. Commissioners voiced no objections, setting the stage for Whisler and others involved in the project to begin gathering comment from business groups, downtown property owners and the public. “We want to hear from a lot of people about what we want this to be,” said Kevin Turner, a Freelon Group Inc. architect who’s helping county officials with the project. The building is opening up because DSS is setting up shop in a new headquarters on the 400 block of East Main Street. The move, now in progress, is scheduled to be complete Oct. 24. The county finds itself now with a surplus of space on the 200 block of East Main, as on the north side of the street it also owns Durham’s former courthouse. Officials don’t see the DSS building as much of a renovation candidate, so they’d like to knock it down. But instead of placing a new building there or reserving the site for one, they’d like to turn it into some sort of green space. County Manager Mike Ruffin endorsed the idea earlier this spring. Jewell said a square would complement the county’s offices at 200 E. Main St., setting it off in a manner once considered normal for public buildings. The county office building dates from 1916 and was originally built as a courthouse. The courts moved out long ago, going first to the “new” courthouse on the north side of the 200 block and now to the genuinely new courthouse officials opened in February across Mangum Street from the Durham Bulls Athletic Park. Turner sketched out three ideas for using the roughly 14,840 square feet of land the old DSS headquarters occupies on the western corner of Main and Roxboro streets. Two involved terracing or stair-stepping the new square, bowing to the reality that the existing building masks what’s rather a pronounced drop from Main Street to the southern portion of the downtown loop. Commissioners liked the terrace idea, noting that it lends itself to multiple uses, perhaps even the use of the site for performances and other events. But they stressed a desire for something green, something well-used enough that it’s not a security problem and something that’s easy to maintain. “It’s better to have activity, eyes on the street, things going on, in urban spaces than to have it empty,” Commissioner Ellen Reckhow said. 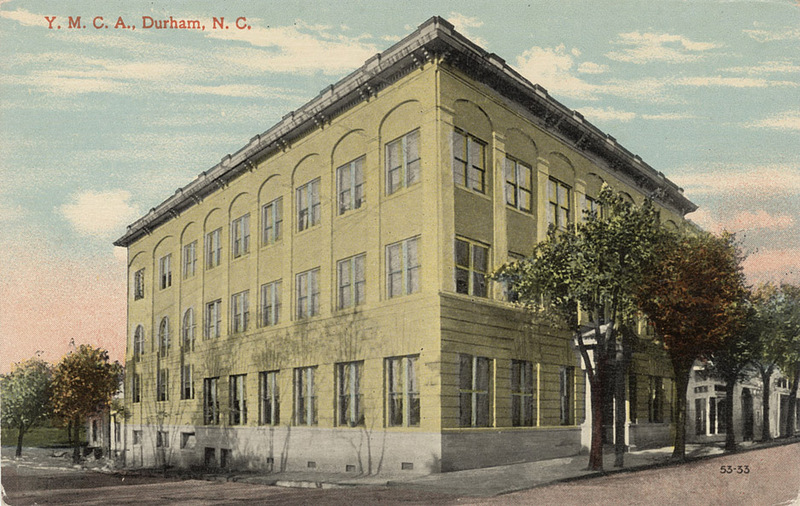 Whisler noted that the county needs permission from Durham’s Historic Preservation Commission before it can knock down and replace the old DSS building. The site is in the downtown historic district. But the preservation commission by law can’t veto demolition; it can only delay it for up to a year. If things go well, Whisler anticipates applying in the spring of 2014 for a preservation commission sign-off. Approval would follow by the winter, with demolition and construction taking six to eight months. That would set the stage for the square to open in the fall of 2015, he said. Turner said the project will lend itself to recycling much of the material in the building. I don't think this building is particularly special, but I strongly disagree with the notion that creating public space here is going to be revitalizing in some way to this intersection or parts east. Few cities, to my thinking, are as profoundly confused about what works well for public space as Durham is. Our public spaces are always defined by roadways and other land use considerations first - rather than optimizing for public space first and roadways/buildings second. It may seem odd for me, as a buildingphile, to write that, but making do with these odds and ends is doomed for failure. Locating a park next to the highway-like intersection / Ramseur exit ramp at Roxboro and E. Main is not a pleasant experience. The biggest problem for the parts east of Roxboro is the sense of physical separation from downtown-west. Creating another gap will worsen this. And given the lack of retail/restaurant immediately around it, it's likely to either be dead space, or the new place for the folks booted out of Urban Ministries in the morning to hang out all day. The other canard I've heard put out there is the notion that demo'ing this building will return the 1916 Courthouse to some original intention to stand on its own in a sea of open space. As this post demonstrates, it never stood on its own in a sea of open space. So there's no historic precedent for that - it's just a fantasy of how it 'should' look. And I think it's a wonderful building - it could stand on its own. But the crappy road intersections and stand-offish buildings around it do not create that kind of space. It just creates desolation. I'm past thinking that the county is going to listen to public input about this. Once they've made up their minds about things like the jail and the surface parking lot in the 500 block of E. Main, they plow ahead. But both the county and city continue to gravely mishandle eastward parts of downtown - in ways that will stymie the growth of downtown, and ultimately kneecap the ongoing success story.